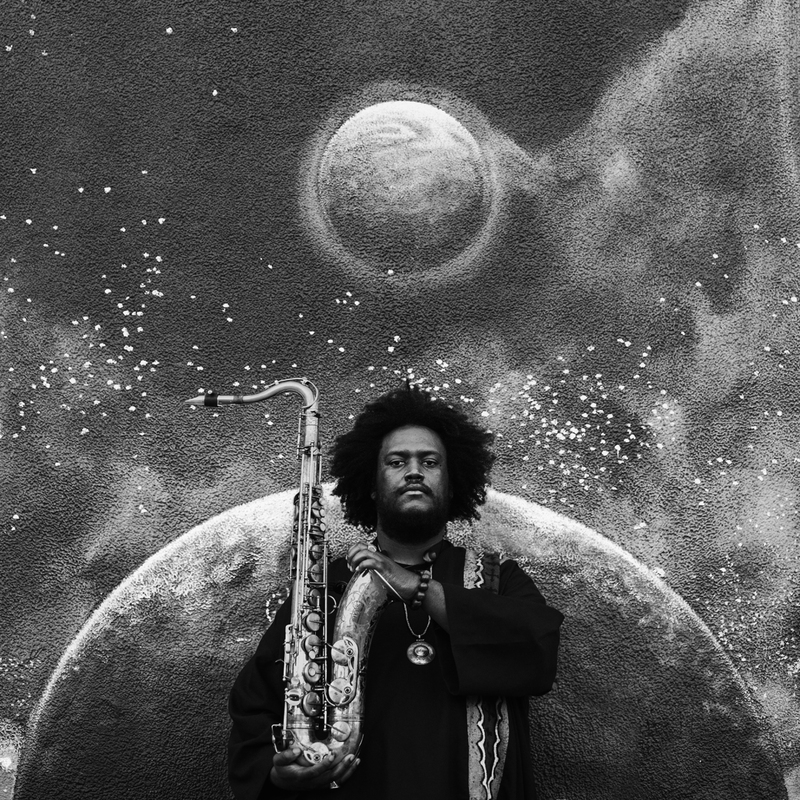 Kamasi Washington’s The Epic is the album (not only) the jazz world is talking about. Almost all the important newspapers and magazines are enthusiastic, critics brim over with enthusiasm. How did Washington achieve that? Does this have to do with the fact that he is a member of the studio wrecking crew for Kendrick Lamar’s To Pimp A Butterfly (for those of you who are not into hiphop: it’s most likely the best and most influential hiphop album in 2015), that the album is released on Flying Lotus’ Brainfeeder label and that he was touring with Snoop Dog? In other words: Is this only a hype sparked off by a clever management that tries to develop the pop market for jazz music? First of all: people who expected a mélange of cool hiphop beats and fusion elements on this album will surely be disappointed – The Epic is a pure jazz album. And in its best moments it is a bow to John Coltrane’s Impressions, to Miles Davis’ In a Silent Way, Weather Report’s Heavy Weather and other classics of the genre. But is it the revolutionary, dark and triumphant milestone so many people claim it to be? Frankly speaking: It is not! Washington goes out on a limb: Already the first track is called “Change of the Guard”, a declaration of war to the jazz establishment (other compositions are called “The Next Step” or “The Rhythm Changes”). The album is indeed epic – it lasts 174 minutes, quite a lot for a debut. His band consists of ten of the best and most hopeful musicians of the L.A. scene (for example electric bassist Thundercat, trumpeter Igmar Thomas and trombonist Ryan Porter) and it is augmented by a 32-person orchestra and a 20-person choir. One of the tracks is Washington’s version of Claude Debussy’s “Clair De Lune”. The whole thing is a real challenge. Unfortunately, this is rather a problem than a promise. Sometimes the tracks are hardly anything more than plain and smooth soul jazz (“The Rhythm Changes”) or full of mind-numbing effects (like the guitar on “Seven Prayers”). Mostly they are simply overloaded like “Henrietta Our Hero”, which sounds like a cheap musical song. An interesting motif like “Re Run” is almost killed by a lame Latin jazz groove, a horrible organ sound and massive violins and swooning vocals which are way over the top. Often you have the impression as if you listened to a modern jazz album and the Star Trek theme song at the same time. It seems as if Washington doesn’t trust his compositions. On the other hand The Epic is not the unpleasant album these lines suggest. What completely saves the music is the excellent and exuberant soloing. Even very ambiguous tracks like “Askim” have marvelous moments when Washington's tenor sax solo veers off into sheer ecstasy and intensity that remind of the greatest moments of Pharoah Sanders or when Brandon Coleman’s keyboards drift away in “The Next Step”. Especially the last two tracks, “Malcolm’s Theme” and “The Message”, show what the The Epic could have been without the kitsch that shines through all the time: a mind-blowing black power jazz album that brings influential 1960s jazz to 2015, a comment on the social situation of the USA, uncompromising, soulful and radical. However, the actual result is an over-ambitioned proof of talent of a creative wunderkind which could use some guidance (possibly a good producer). It will be interesting to see what he will be able to achieve in the future. I guess I'm glad the review was a bit "negative" with only 3 stars, otherwise I might not been motivated to listen looking for "problems" ... and I can't really hear any. I'm still playing this and quite enjoying it.